Cattaraugus County is a county located in the U.S. state of New York. As of the 2010 census, the population was 80,317. The county seat is Little Valley. Cattaraugus County comprises the Olean, NY Micropolitan Statistical Area, which is also included in the Buffalo-Cheektowaga, NY Combined Statistical Area. The largely unsettled territory, traditional homeland of the now-extinct Wenrohronon Indians, was claimed by at least three territories: New York Colony, Massachusetts Bay Colony and Pennsylvania Colony up until the 18th Century. When counties were established in New York in 1683, the present Cattaraugus County was part of Albany County. This was an enormous county, including the northern part of New York as well as all of the present state of Vermont and, in theory, extending westward to the Pacific Ocean. This county was reduced in size on July 3, 1766 by the creation of Cumberland County, and further on March 16, 1770 by the creation of Gloucester County, both containing territory now in Vermont. On March 12, 1772, what was left of Albany County was split into three parts, one remaining under the name Albany County. One of the other pieces, Tryon County, contained the western portion (and thus, since no western boundary was specified, theoretically still extended west to the Pacific). The eastern boundary of Tryon County was approximately five miles west of the present city of Schenectady, and the county included the western part of the Adirondack Mountains and the area west of the West Branch of the Delaware River. The area then designated as Tryon County now includes 37 counties of New York. The county was named for William Tryon, colonial governor of New York. In the years prior to 1776, most of the Loyalists in Tryon County fled across the Niagara Frontier into modern day Ontario, Canada. In 1784, following the peace treaty that ended the American Revolutionary War (and a treaty with Massachusetts that finally settled who owned Western New York), the name of Tryon County was changed to Montgomery County in honor of the general, Richard Montgomery, who had captured several places in Canada and died attempting to capture the city of Quebec, replacing the name of the hated British governor. In practice, however, these counties did not cover modern Cattaraugus County or Western New York, as most of it lay within the Indian Reserve and was off-limits to European settlement until after the Revolutionary War. Ontario County was split from Montgomery County in 1789 as a result of the establishment of the Morris Reserve. In turn, Genesee County was split from Ontario County in 1802 as a result of the Holland Purchase. It was not until this time that significant settlement of the territory happened. Shortly afterwards, Genesee County was made smaller in 1806, by the creation of Allegany County. Numerous towns in the county are named after agents of the Holland Land Company, including Ellicottville (Joseph Ellicott), Franklinville (William Temple Franklin, grandson of Benjamin Franklin), Otto and East Otto (Jacob Otto). According to the U.S. Census Bureau, the county has a total area of 1,322 square miles (3,424.0 km2), of which 1,310 square miles (3,392.9 km2) is land and 12 square miles (31.1 km2) (0.94%) is water. Cattaraugus County-Olean Airport is located outside of Olean located in the Town of Ischua . Cattaraugus County is run by a unicameral legislature with an appointed county "administrator," who serves many executive duties of a county executive but has no legislative veto power and is not elected. The legislators themselves are independently elected (while some also serve as mayors of the villages they represent, their status as mayors does not affect in any way their seats on the legislature and thus it is not a Board of Supervisors). The votes of each legislator are counted in proportion to the number of people that said legislator represents (for example, if a legislator from Olean has 10,000 people in his/her district, and the legislator serving Lyndon only has 5,000, the Lyndon legislator's vote has only half the worth of the Olean legislator's). There are currently 21 members of the legislature with 15 Republicans and 6 Democrats; the county is in the process of reducing that number to 17. Each legislator serves a four-year term, with a limit of three terms. The legislature is a majority Republican, with Norman L. Marsh serving as Chairman, and James J. Snyder of Olean serving as Vice-Chairman. The county is generally considered a "red county," with Republicans usually outvoting Democrats in most statewide and national offices (for instance, in 2004 John Kerry in Cattaraugus County by a 60-40 margin) though Bill Clinton won the Cattaraugus County very narrowly in 1996. However, in 2006, the county narrowly chose Eliot Spitzer over John Faso by a margin of about 1% in the governor's race, and Hillary Clinton surprisingly defeated John Spencer in the county by a 10 percentage point margin. (That being said, in all other positions up for office that year, Republicans—including all congressional and state legislature representatives—still won.) In 2008 it continued its tradition as a red county. John McCain defeated Barack Obama by a 55-44% margin. In 2010, Republican Carl Paladino carried Cattaraugus County over Democrat (and eventual winner) Andrew Cuomo 65% to 31%, but Senator Kirsten Gillibrand and Senator Chuck Schumer, both incumbent Democrats, carried the county by 51% to 46% and 54% to 43% margins respectively. Olean is the largest city in the county and is the major center for business. Ski country runs through Cattaraugus County; two ski resorts, popular with Canadians, lie in the town of Ellicottville; in addition, several snowmobile trails cross the county, including the Pat McGee Trail, a flagship for the county's trail system, and the North Country Trail. 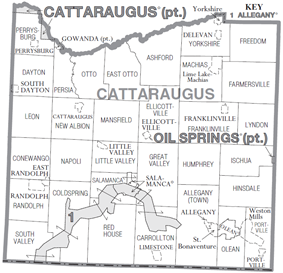 Cattaraugus County is considered part of Appalachia, as well as Western New York, upstate New York, the Southern Tier, the Twin Tiers and the Buffalo-Niagara-Cattaraugus Combined Statistical Area. As a result of this geographic crossroads, the people of Cattaraugus County speak a variety of accents, ranging from mild variants of Appalachian English to Inland Northern American English, with a handful of people speaking in the more loud and nasal Buffalo English. A large Amish community is located in the western part of the county. Their presence partially explains the county's unusually high rate of homes without full indoor plumbing compared to nearby counties. A branch of Jamestown Community College, in Olean provides higher education for residents. Olean Business Institute provided specialized education and is also in Olean, but closed in 2013 due to financial and enrollment declines. Jamestown Business College operates a satellite campus in Salamanca; Cornplanter College, which opens in 2014, is also located in Salamanca. St. Bonaventure University is also in this county, located in its own census-designated place just west of Olean. Designation in parentheses indicates official level of government. ^ "Great Valley Airport (N56)" (PDF). New York State Department of Transportation. ^ 1.6 million Americans don't have indoor plumbing. Here's where they live. The Washington Post. Retrieved April 24, 2014.